2016 Jeep Wrangler Unlimited Sport S SOLD!!! Home > > Vehicles > 37664 > 2016 Jeep Wrangler Unlimited Sport S SOLD!!! 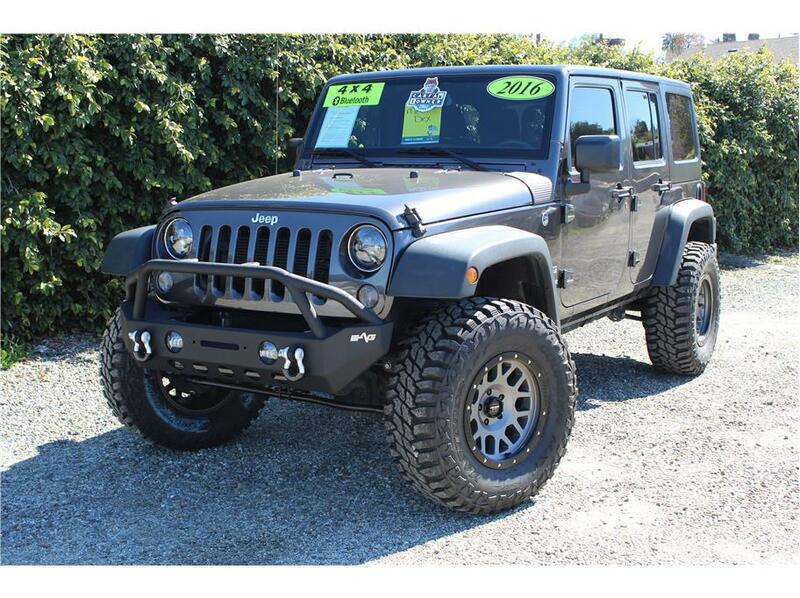 Our really clean lifted 2016 Jeep Wrangler Unlimited Sport S has the sought after Pentastar 3.6L v6 engine with an automatic shiftable transmission and only 37k miles. This One Owner Wrangler has an awesome brand new 3.5 Inch ProComp Lift, five matching 17 inch ProComp wheels wrapped with 35 inch Mud Terrain tires, brand new front bumper, an oversized Smittybilt tire carrier, aftermarket LED head lights and fog lights, and a top mounted stabilizer bar. There is also the great factory features like U-Connect which includes Bluetooth connectivity, cruise control, and steering wheel stereo controls, power windows, power door locks, power mirrors, factory three piece hardtop, black cloth interior and aux input to listen to your favorite tunes on the go! Our Jeep just went through a complete 151 point inspection and along with the new lift and tires we had new rear brakes installed and all new premium tie rods in the front end, and topped it off with a new cabin and air filter, a fresh oil change service, and torqued the whole suspension. This Granite Crystal Jeep won’t last long so don’t hesitate on it. Its hard to find them this clean. Don’t let it pass you up, come test drive it today!